What do you set your makeup with? I have been more breakout prone than ever recently since having a baby almost two months ago. I am trying to nail down a skincare routine that will work for me (I wrote about what I’m using from Kiehl’s the other day but I’m trying a couple new things right now too) and I’m always experimenting with the best coverage I can get for makeup to hide my acne flare ups without irritating my skin further. 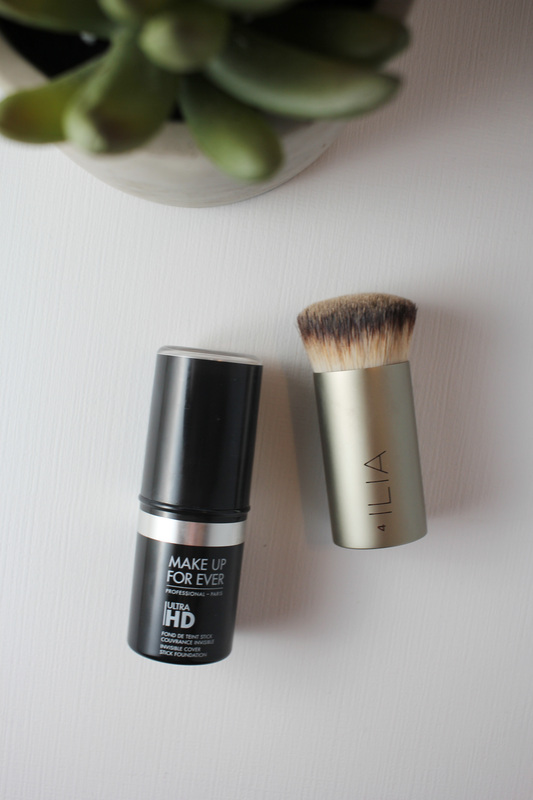 Recently, I fell back in love with Make Up For Ever’s Foundations and I’ve been wearing the Ultra HD Invisible Cover foundation a bunch lately. I also have a stick of the Ultra HD Invisible Cover Stick Foundation that hasn’t gotten quite as much love over time. I love the amazing coverage that still looks like skin, but I can never quite blend it out right. 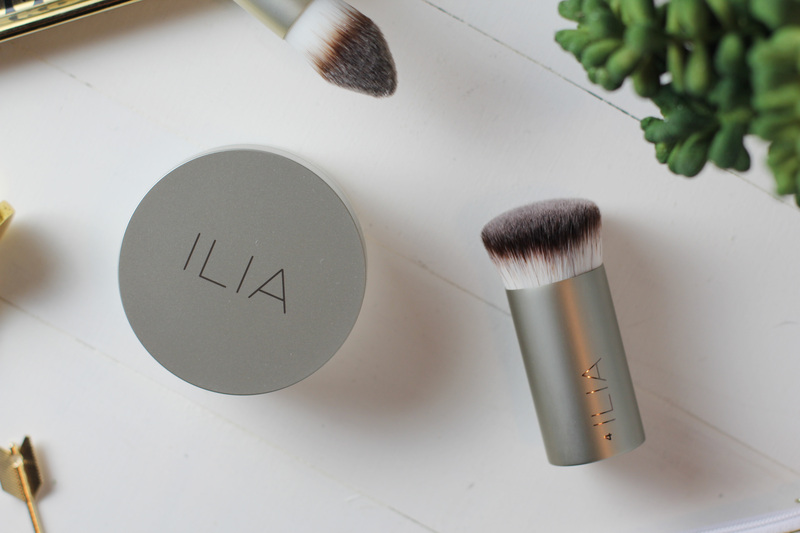 Recently, I discovered the brand ILIA, an organic beauty brand. I started dabbling into the brand during the same time period I was experimenting with the stick foundation. What I found was the perfect marriage between foundation and finishing powder that I’ve probably EVER tried. And also, the perfect duo of stick foundation and beauty tool for application. You guys, SERIOUSLY, I am absolutely enamored with this combination. 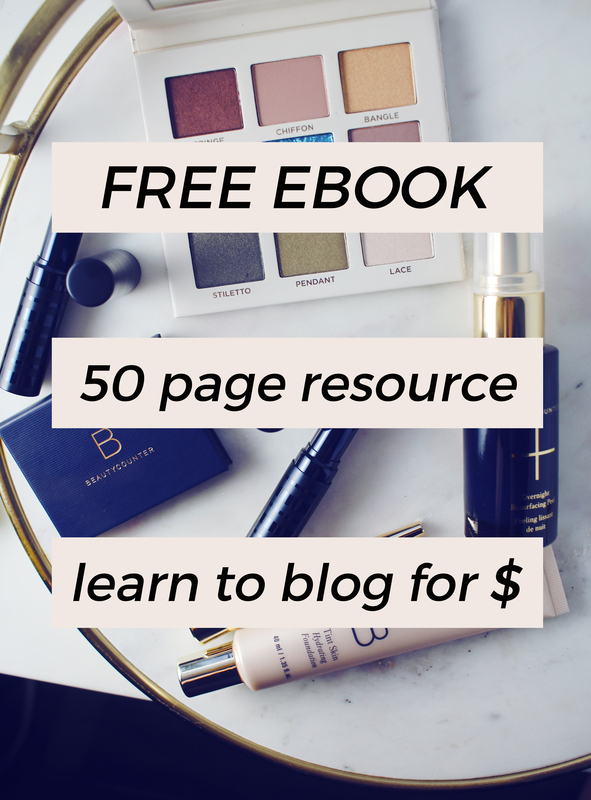 I’ve always known that using the right tool can make such an enormous difference in makeup application. ILIA has a new brush called the Perfecting Buff Brush that has short, dense bristles and it’s what stick foundation dreams are made of. I have found that when I apply my stick foundation and buff it in with this brush, I look flawless. 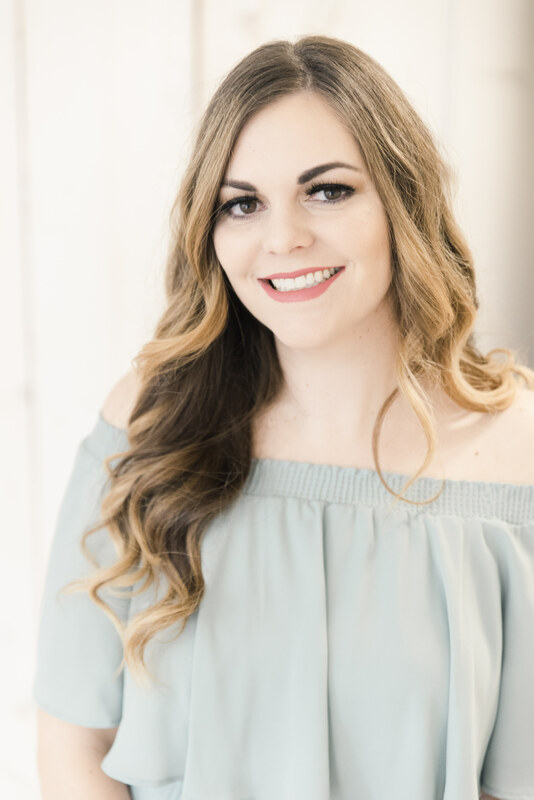 It blends the product in seamlessly and quickly, buffing the product into my skin in a way that I did not know was possible with a thicker foundation. It is just perfect- just as the name of the brush would suggest. I’ve owned other dense brushes in the past that moved the product around on my face, but this one buffs the cream until it is one with my skin. It’s also worth noting that the bristles are made with high-grade, synthetic Taklon that’s easy to clean and cruelty-free. I found that when I washed this brush with mild soap that it dried almost instantly. Magic! 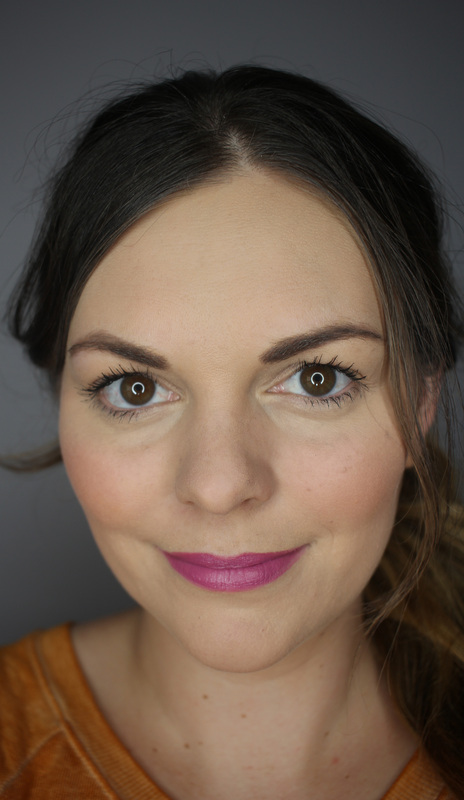 I have their Foundation Brush as well, and I am loving the angled tip for under my eyes and around my nose. I haven’t experimented with it as much as the Buff Brush but the thick bristles will make it perfect for using with a thicker concealer like Benefit’s Erase Paste. Now for the power couple- Ultra HD Invisible Cover Stick Foundation sets beautifully with ILIA’s new Fade Into You Soft Focus Finishing Powder. I have been on a foundation and finishing powder kick for the past couple months, always looking for a new and better combination. This stuff is the bomb and has a natural, translucent finish. it’s organic, talc-free, and does a great job setting my stick foundation while still allowing my skin to breathe. I haven’t tried to “bake” my makeup with this, but I apply it with a fluffy powder brush and I think the look is very subtle and soft. 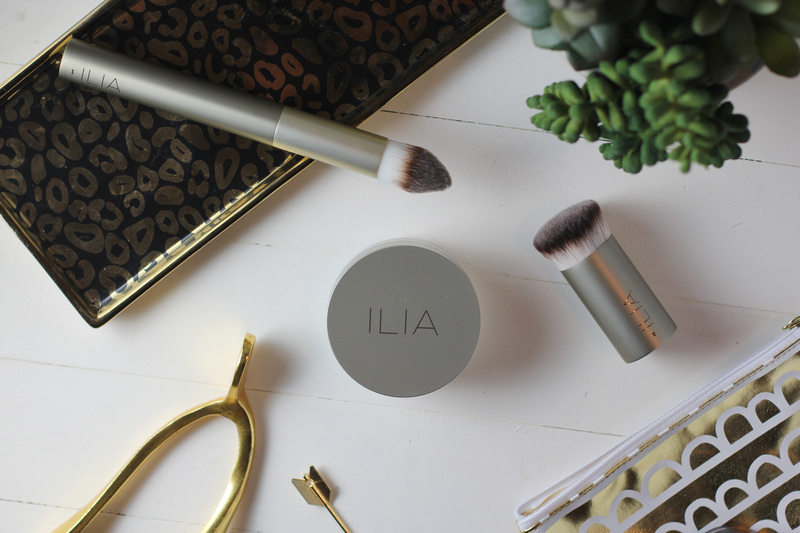 I love all of these new ILIA items I have discovered, and especially my favorite new combination of foundation and setting powder. 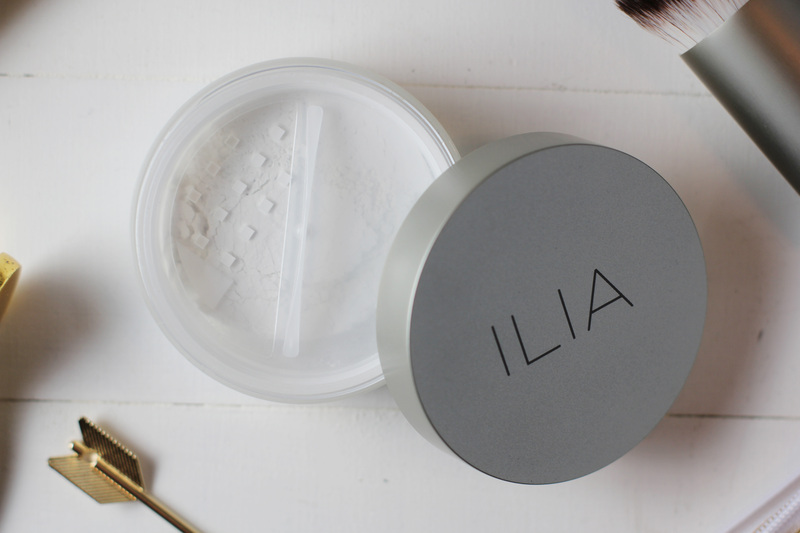 I can’t wait to dive into ILIA a little deeper- I am seeing more goodies on their website I want to get my hands on! Have you tried any of these products? What do you set your makeup with? Have you heard of ILIA?